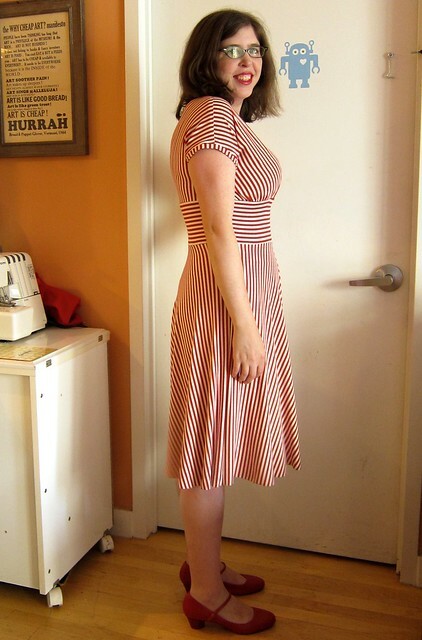 Sweeter than candy: I finally made my striped Tiramisu knit dress! Seriously, I have been planning to make a candy-striped Tiramisu with this fabric since last August, when I was still illustrating the first Cake Patterns envelope cover! And I'm so glad I finally sat down and did it, because this dress in this soft, stretchy knit is pure happiness. 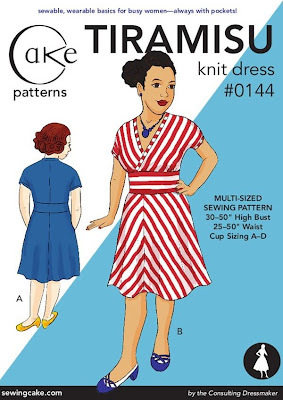 The pattern: Cake Patterns Tiramisu Dress 0144. Pattern Description: Knit knee-length dress with front mock wrap neckline, cut-on sleeves, customizable midriff and flattering half-circle skirt. Pattern Sizing: The pattern is sized for a 30-54 inch high bust, 25-50 inch waist and has bust proportion sizing A-D.
My high bust is between 34" and 35", my full bust is 38.5" and my underbust is 30", so I initially chose to make a 35D (see muslin post here and wearable muslin top here). That turned out to be a bit large in the bust and back for me, especially since I was using a very stretchy knit and I prefer a really close fit with plenty of negative ease. 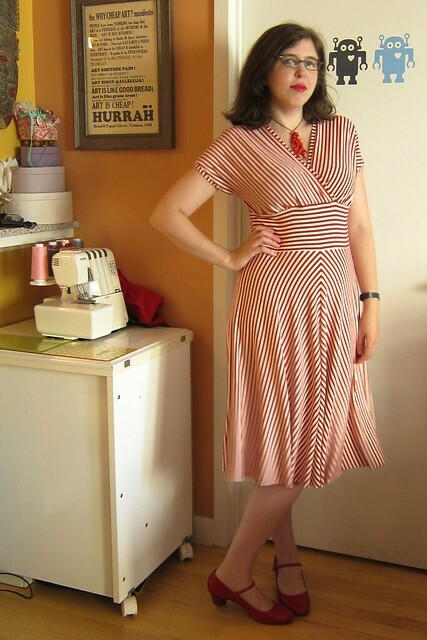 For this dress version in my fancier fabric with plenty of horizontal AND vertical stretch, I went with a 30D wide bodice with a 1" FBA but cut just the 30A length (I based this length on measuring some well-fitting RTW surplice knit tops I had that hit me exactly at the underbust). And I used the size 30 back bodice. This worked GREAT but if I use a fabric with only horizontal stretch for the next one I will need to make it longer over the bust (maybe the 30C or 30D length). Sweet sweet candy-colored peppermint back chevrons! Fabric: This fabric is out of control awesome. It's a light-weight, yet substantial red and white cotton-spandex knit with good recovery that I bought on a sewing club outing to NY Elegant Fabrics for $15/yard. At the time I felt guilty paying $45 for a hypothetical me-made dress, but this fabric is amazing. It is softer than soft, has stretch in both directions and is drapey (but not TOO clingy). Also: candy stripes. So... worth it! Were the instructions easy to follow? Obviously I'm quite biased, but I followed them almost exactly and was quite pleased with the results! Pattern thoughts: So. Knit dresses. Lately I have been wearing knit dresses three days out of five. Because they are the perfect garment — no mixing and matching, just throw it on, pick some shoes and a necklace (and maybe a cardi) and I am DONE and I even look FANCY when I am chasing my toddler around the farmer's market or playground. ... a no-gape neckline! NO cardigan needed for bra-hiding modesty! Thanks striped neck binding! Pattern alterations: I did leave off the pockets on this version, but only to make sure I had enough fabric left over to recut the bodice if necessary (which it wasn't). I cut the fabric on a single layer to make sure the stripes were just so. I made this on a mix of sewing machine and serger as recommended in the pattern instructions. My walking (aka dual feed) foot helped a lot in keeping the jersey from rippling out of shape and in pattern matching at the seams. Stripes! Stripes! Chevrons and stripes! Lovely binding that is NOT in any way stretched out of shape. Tiramisu 30 Minutes a Day Sew-Along. Wear for: Work or a date. I love it so much and the fabric is so nice I am a bit afraid to get it grubby at the playground. So I might make a second version in a less fancy knit for weekend wear. *So the asterisk in the post title is because this dress isn't actually hemmed yet. BUT one of the hemming options recommended is to leave it raw... either permanently or just for a few wears until it settles. So it is finished ENOUGH. For now. I do think I will do a twin-needle hem to even things out, as it seems a bit shorter in the front than the back (though that might be a bad posture thing). Great-looking dress, Mikhaela! I'm a big fan of candy stripes myself -- classic. Well done. Thank you Peter! They are a classic. Don't you look gorgeous! Beautifully constructed and the fabric is so adorable. It is fun, isn't it? thank you! What a fantastic dress! You look great in it. 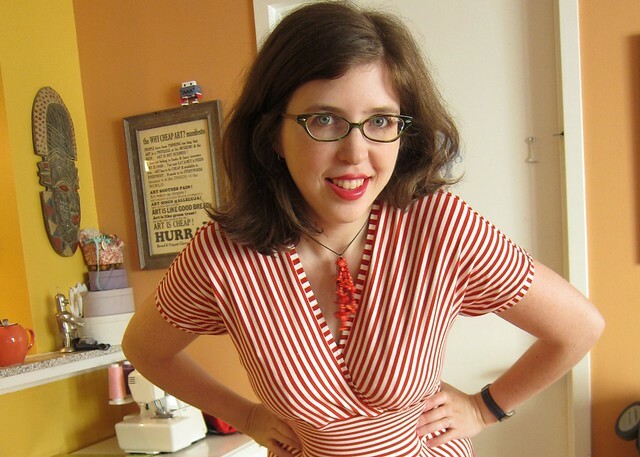 I also love knit dresses myself. I wore them almost exclusively during my last trimester. You've also convinced me to get this pattern. 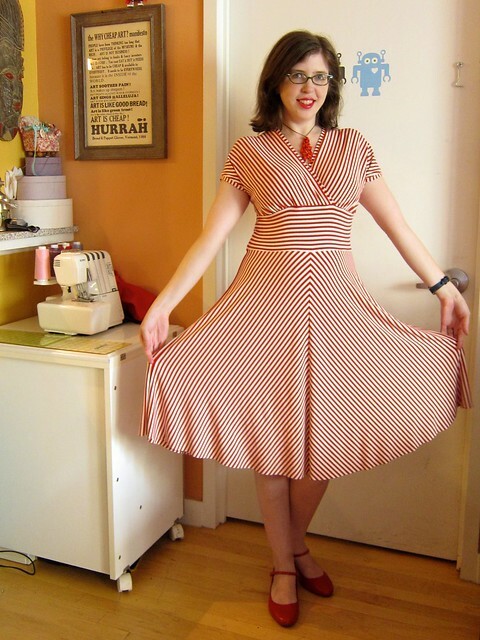 I want my own fabulous stripy dress! how awesome! I think you will love making/wearing it! You should make a dozen of these. This dress is so incredibly flattering on you! You did a marvelous job. 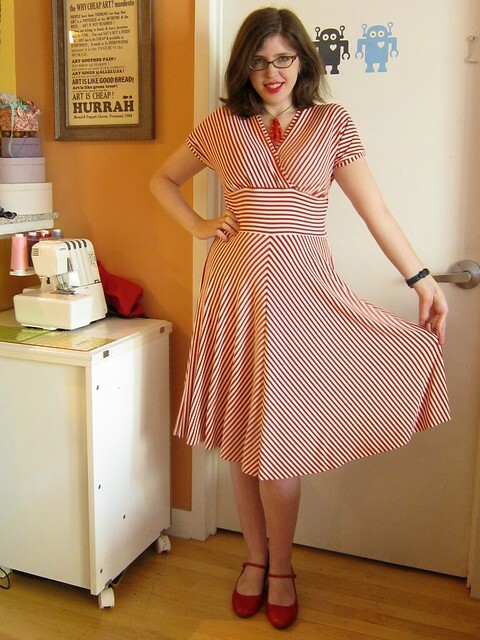 Love those stripes and chevrons! 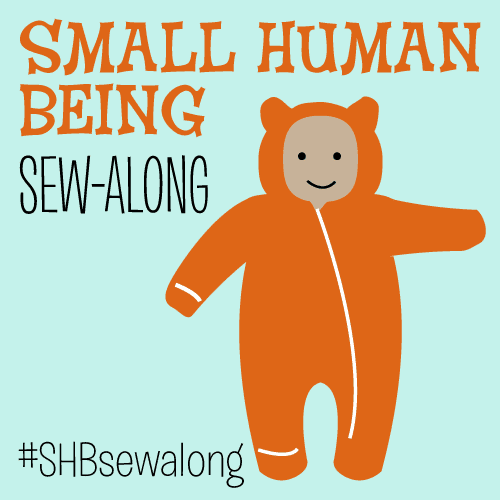 Oh, wouldn't I LOVE to have that sewing time... but I'm at least going to make one or two more. You look so beautiful and happy! Superior stripe-matching, too. 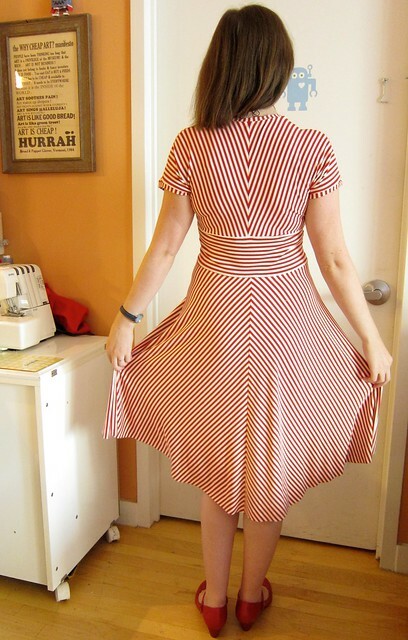 The stripe matching was all about using a walking foot (and cutting everything single layer and really being careful). When art meets life meets art! There's something very meta about your dress and your pattern cover art. :D Congrats on your new gorgeous dress. It IS very meta, isn't it? I should have put myself on the envelope cover next to Penelope but I didn't want to mess with PhotoShop, I couldn't wait to share the finished pictures. What a great dress, and the fit is fantastic! - of course! Thanks for including the obligatory no-gap view - lol. It's beautiful and you look fabulous in it! Great dress, and those shoes are delicious. I've been reading/lurking/stalking your blog for a loooooong time and have never commented before. First of all, your dress is amazing!!! Job very well done on matching up the stripes! But what really brought me out of the woodwork is to say MAJOR props on nursing into toddlerhood. My little guy just turned 1 and I get asked on a regular basis, "Are you STILL nursing?!" It's such a stupid question and it takes major self-control to smile and say, "Why yes, we are indeed." We have no immediate plans to wean and I am always encouraged when I hear of other mommies nursing past 12 mos old. So thank you for the creative and mommyhood inspiration! ha! actually I found it easier to KEEP nursing than stop nursing... she nursed until she was 2 years and 9 months old. At the end she was just nursing once or twice a day but it was still a good way to calm her down when she was upset or had a tantrum. She still talks about it all the time. She says "Mommy, when I was a baby I used to nurse. Now I am a big girl and I don't nurse anymore. Boobies! Boobies! Boobies!" Lovely dress! You did an excellent job. I love how your shoes, necklace and lips match. :) Oh, and I'm a knit dress lover, too! What a fabulous dress! Love that fabric - it's marvelous! And YAY for no gape necklines and comfy knit dresses!!! Love the dress, it makes me want a peppermint ice cream! I love this pattern! I want to make another one! And yes yes yes yes yes about knit dresses.